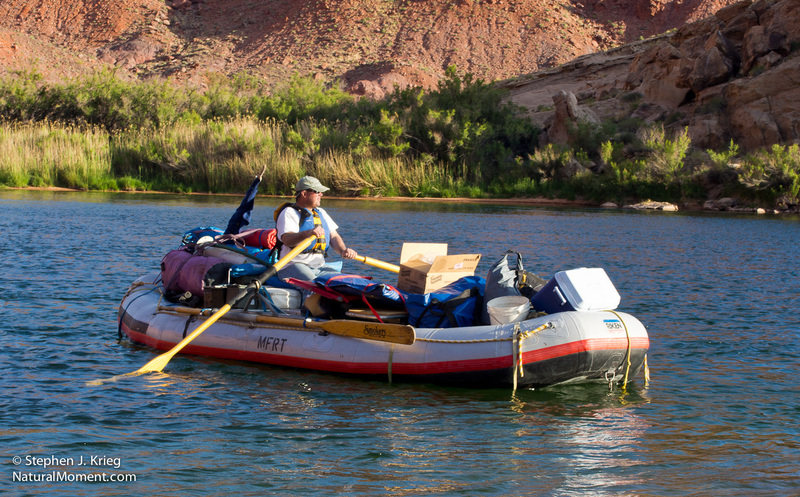 River rafter launching from Lees Ferry, Colorado River, Arizona. Back at one of my favorite places on Earth: Marble Canyon on the Arizona Strip in northwest Arizona. Grand Canyon Country north. After another wonderful sunset time visit to nearby Lees Ferry, watching river running trips put in to the Colorado River to run Grand Canyon, I was anticipating the full moon rising over the Echo Cliffs to the east. Amazingly, the azimuth (compass direction) that the full moon was rising this month allowed me to include it in shots of Navajo Bridge on the way out of Lees Ferry. 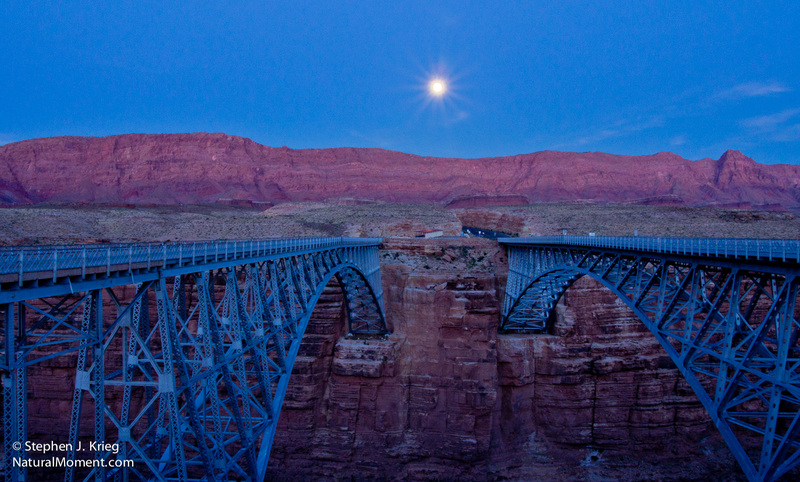 Full moon rising over Echo Cliffs and Navajo Bridge, Marble Canyon, Arizona. With the bridges so close in the foreground, the only way to include the moon in the scene was a very wide angle shot. The moon is thus made a small but important accent to the image. The star effect is from the small lens aperture, not any special effects filter or post processing tricks. Photo Location: Marble Canyon, Coconino County, Arizona. Navajo Bridge and the Colorado River, from the old bridge, Marble Canyon, Arizona. Back to the Arizona Strip after a two year absence. As always I was anticipating a stop at Navajo Bridge on Highway 89A at Marble Canyon. It did not disappoint. 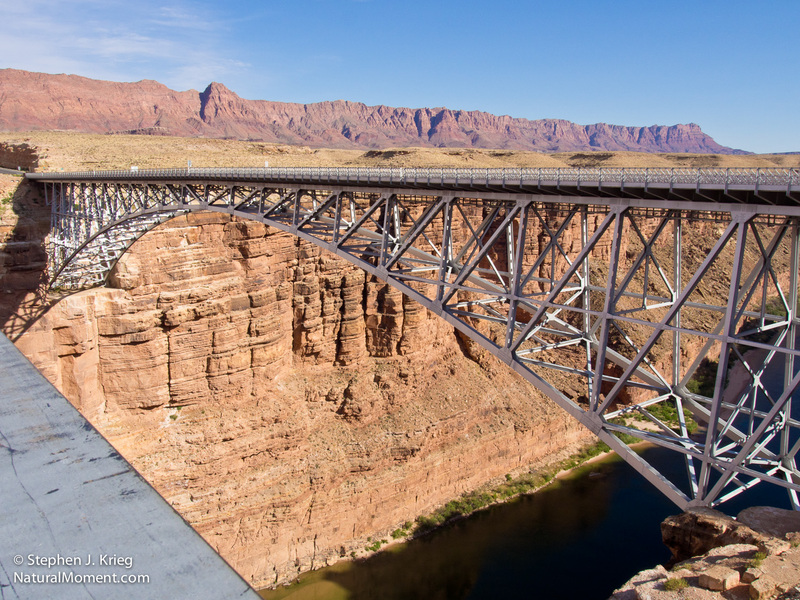 Navajo Bridge spans the Colorado River across its 470-foot-deep gorge into the Marble Platform (which isn’t marble, in case you’re wondering). The original bridge was replaced by the new bridge when vehicles became too big and heavy for the old one to safely handle any more. Instead of tearing the old bridge down, somebody had the smart idea to gate it off and use it as a pedestrian bridge for tourists. That’s right: you can park your car and walk out on it, all the way across. It’s an awesome experience. The east end of the bridge is on the Navajo Nation, where a number of Navajo artists sell their wares, including jewelry and pottery. The west end is within the Glen Canyon National Recreation Area, and the National Park Service has an interpretive center there to give out information and sell books and maps and such. It doesn’t matter which end you stop at. Walk all the way across, or stop at both ends with your car and gawk from the rim of the gorge if you’re uncomfortable with dizzying heights. Be sure to look for the re-introduced California Condors that live in the area. They like to hang out on the cliffs near the bridge, and even on the bridge structure underneath the highway. Also on the west side of the river is Marble Canyon, Arizona, which has the Marble Canyon Lodge, with gas, convenience store, laundry, and a Post Office (Zip code: 86036). Cherished amenities in the middle of nowhere. Not only that, but historic Lees Ferry is just up the road. That’s where all boats put into the Colorado River to run Grand Canyon. Add the towering Echo Cliffs on the east side and the Vermilion Cliffs on the west and you’ve got quite the scenery. But in this case, I will pass this way again. And soon. The Marble Platform at the upper end of Grand Canyon. Lees Ferry. The Echo Cliffs. It’s been a couple years, too long. One of the most beautiful areas in the Southwest, the Arizona Strip. 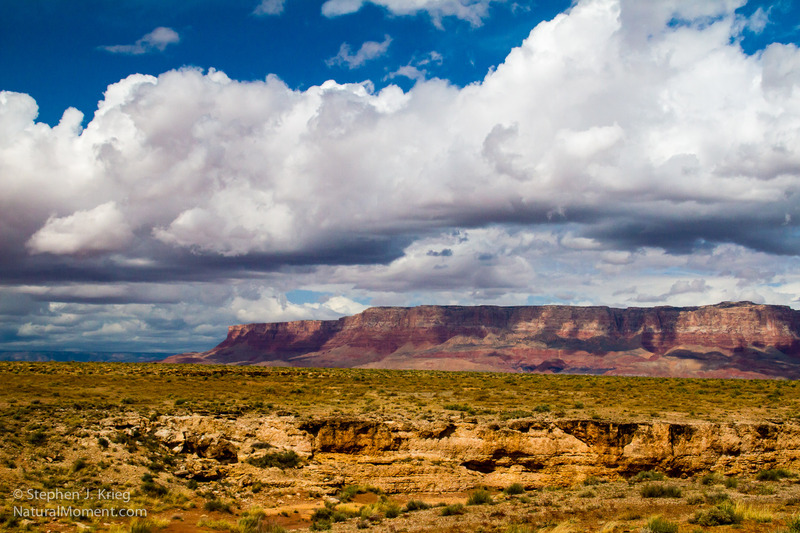 As I cross the Colorado River at Marble Canyon and drive along the base of the Vermilion Cliffs. Then up onto the lofty, forested Kaibab Plateau and back south again to the North Rim of Grand Canyon. Only this time it won’t just be overnight or for the weekend. It will be for the entire season, living and working up there. Spring, summer, and fall. Well, of course there was a peacock walking across the road in Skull Valley, Arizona this afternoon. Is There An Actual End of the Trail?